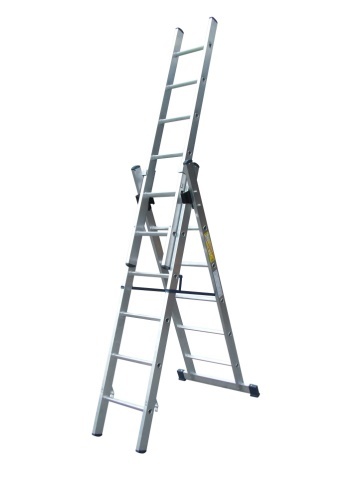 Lytes best selling trade ladder reinvented as a multi-functional combination ladder. Versatile use as either a 2 or 3 section ladder, double sided step, extended step ladder or for use on stairs (6&9 Tread Only). Certified to BSEN131. Large comfortable 'D' shaped rungs for comfort and stability. Strong box section stiles. Large stabilizer bar. Solid side arms increase stability. Suitable for regular trade use.